Permanently repair damaged walls and ceilings. The repaired surface is smooth, beautiful, no cracks and no difference with the original walls after repairing. Main three sizes available: 4"x4", 6"x6", and 8"x 8"; other size upon your request. lightly sand around hole and wipe clean. 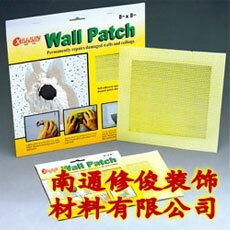 Remove backing paper from wall-patch. apply patching compound to metal side of wall-patch and press firmly over hole. cover entire patch area with compound, include feathering edges. Let dry. Then sand. Repeat as request. Apply texture. Then prime and paint or wall covering.